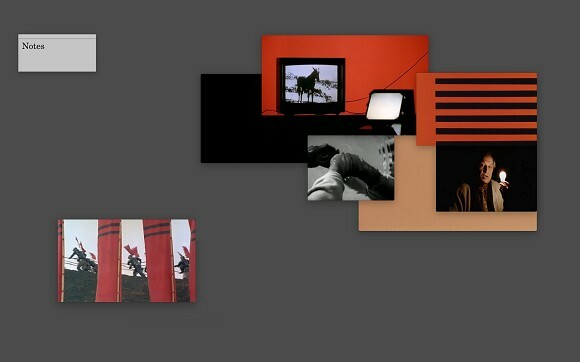 London-based artist Sam Smith presents Notes (2014), a live video essay performance in which a constellation of poor images are brought together into a stream of collaged audio-visual vignettes. Fragmented scenes draw together key reference points from Smith's practice including the mediation of object via the camera eye's flattening gaze; the cinematic framing of landscape; and, through architecture, an audience's complicity in the projection image. For KW's *Chora*, Smith incorporates targeted satellite imagery, text overlays, and subtle software interventions to open up new connections inside his shifting archive of sampled material. From a central computer, the combination of data is beamed onto a site-specific architectural screen, where layered surfaces push rectilinear footage into three-dimensional relationships. By deploying the windowed environment of the Mac operating system, and re-purposing the functionality for which it was created, the artist constitutes a post-cinema, hyperlinked apparatus. Sam Smith currently lives and works between London and Sydney. From 2013 to 2014 he was part of the International Studio Programme at Künstlerhaus Bethanien, Berlin. Recent solo projects include **Notes on the Apparatus** selected by Vdrome for the Artists' Film Biennial, Institute of Contemporary Arts, London (2014); **Frames of Reference**, a solo exhibtion at The Royal Standard as part of their Liverpool Biennial 2014 program (2014); and **Form Variations** at Künstlerhaus Bethanien, Berlin (2014). The event is kindly supported by the Australian Embassy, Berlin.